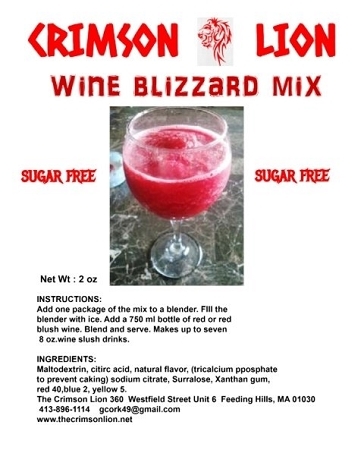 We are pleased to announce that this new sugar-free drink wine slush drink mix is here and selling fast. Low carbs and no sugar. Have that glass of wine without the worry. Check with the wine companies for sugar content in their dry red wines. In a blender empty 1 package of mix. Fill blender with ice and add one bottle of 750 ml dry red or dry blush wine. Blend to make a slush drink. Makes (7) 8 oz. sugar-free wine slush drinks.